People say that if something seems too good to be true, then it probably is. Yet somehow, when you stay at Courcheval C - the ski slopes right outside of your door, unbeatable views of the San Sophia range, and mere steps to the Mountain Village core - you might find yourself questioning everything. This is really is one of those rare homes that is everything you wanted, and more. 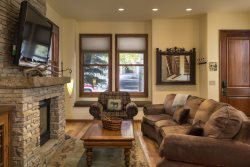 Large picture windows in the living room draw your eye outside to the unobstructed mountain views and vast snowy landscapes while you warm yourself in front of the stone fireplace. For a change of scenery, head down to the hot tub for similar sight lines while you soak your tired bones after a day spent exploring. This 4 bedroom, 4.5 bathroom condo is perfect for groups and families alike, and with this convenient location right off the Meadows ski run, you might think this property is a dream. Go ahead and pinch yourself though, because everything about Courcheval C is just as good as it seems. By Colorado State Law, occupancy cannot exceed the maximum amount of 10 for this property at anytime.